As I anticipated, you guys jumped all over this one. Congratulations to Dan Coleman, who got it right in about 0.3 picoseconds. What is it? Edaphosaurus boanerges! Edaphosaurus is a member of the group too often called the “mammal-like reptiles.” I’m not a fan of that phrase because it makes them seen like a halfway group of organisms, on their way to being mammals but not quite there. We know evolution doesn’t usually work that way, with one form gradually morphing claymation-style into another. I’d love to give you a catchy name to replace “mammal-like reptile,” but I can’t. Closest I could come is “stem mammal” but that’s rather bland and potentially misleading. Modern taxonomy has yet again has made things difficult. To understand the place of Edaphosaurus, let’s start with amniotes, which are tetrapods whose young are encased in an amniotic sac, as opposed to tetrapods that lay their eggs in water. Now, if you’re talking to a paleontologist who studies amniotes and you want to dismiss something, don’t say "I need that like a hole in the head". 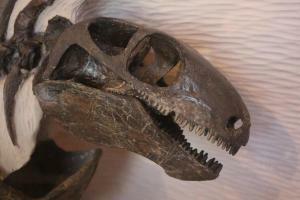 Holes in the head are really important for paleontologists. The number of the holes on each side of the head of an amniote helps to diagnose what lineage it belongs to. Reptiles—and therefore birds—are diapsids (two-holers), with the exception of the where-do-they-go turtles, which are anapsids (no-holers). But there are also one-holers: the synapsids. They include you and me and Tony the Tiger—all of the mammals, in short—but they also include various cousins, like Edaphosaurus, that aren’t mammals. Whether they’re mammal-like is perhaps debatable—maybe they would have said we’re edaphosaurid-like—but they certainly weren’t reptiles. That doesn’t seem to discourage the toymakers, who routinely package non-mammalian synapsids, especially Dimetrodon, with their dinosaur toys—even though they’re from the Permian, way before dinosaurs were a glint. Museum of Comparative Zoology, Harvard University So Edaphosaurus is a non-mammalian synapsid. There are lots of them, but one particularly interesting thing about Edaphosaurus in particular is that, from studying its teeth, paleontologists know that Edaphosaurus was a plant-eater—and in fact it is one of the first vegetarian tetrapods known. It was first described by American paleontologist (and “Bone Wars” participant) Edward Drinker Cope in 1882. Edaphosaurus, like Dimetrodon, had a large sail on its back supported by elongated vertebral processes. The leading theory is that these sails aided in temperature regulation, and this idea is supported by the clear marks left by blood vessels going up and down the bony supports.